ROCK STAR: Diamonds are commonly regarded as the "go to" luxury item for special occasions — engagements, anniversaries, births, and the like. But what if a common diamond just isn't enough? What if you need something truly special or undeniably perfect — the Rolls Royce of diamonds? Enter the Hearts on Fire diamond — a luxury brand for the luxury item. These perfectly cut gems are so brilliant they almost generate their own light. But beyond being, well, perfect, they are also conflict-free. Hearts on Fire adheres rigorously to the Kimberly Process, an international agreement formed by the United Nations and all diamond-producing countries to ensure the stones are not "blood" diamonds. Hearts on Fire diamonds are the diamonds used in the $6.5 million Victoria's Secret fantasy bra, and they aren't just for the super-wealthy, with prices at King Fine Jewelry starting $1,350. Not the diamond type? Check out the line of Frederic Duclos silver jewelry — particularly the silver dangling disc ring at $135. All available at King Fine Jewelry, 4568 Poplar, in Laurelwood. 767-5464. LUX LIFE: Lux isn't just for the ladies anymore. Gold and silver are showing up in more men's shops thanks to brands like Supra and Creative Recreation. Both make court shoes that play nicely in all arenas, from sports to social. Supra's chrome mesh limited-edition Suprano High is technically a skateboard shoe and a technically good shoe, at that. It features superb ventilation, extra heel protection molded into a lightweight EVA insole, and a mid-sole injected with SupraFoam, which provides impact resistance for the entire foot and optimal board-feel. Yet, none of the high-tech allure of these kicks compromises the fact that they look and feel as cool as the other side of the pillow. Supra Suprano's, $129. Another hit on the shine radar: the Magistrate T by KidRobot, $50. Both available at R.Sole, 374 S. Grove Park, in Laurelwood. 761-1230. SHINE ON: Here's an idea to help you save on airfare this season: Stay in Memphis to shop. James Davis' Cami Krablin has already taken that dream New York shopping spree for you, and she's brought back Armani. 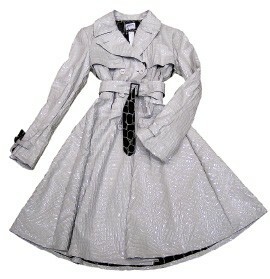 This gorgeous, embossed, shiny patent crocodile-print trench is supremely appropriate for every season and all occasions. (The lining is almost as fabulous as the exterior. You'll want to expose it at every opportunity.) Trench, $1,925. But if you haven't stopped in James Davis lately, it isn't all Armani, Etro, and Missoni. James Davis now carries L.A.M.B, Vince, and this great find — Blank/Conditions Apply black dress with metal coin detail, $325. All at James Davis, 400 S. Grove Park, in Laurelwood. 767-4640. HEAVY METAL: Your clothes don't have to be the only things that radiate this season. Here are a couple of quick picks to brighten your day and your complexion. 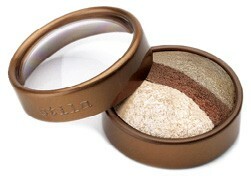 Stila's eye-shadow trio in gold glow: Yummy, sheer, shimmery hues bring out the golden girl in everyone, $26.75. Meanwhile, the light-reflecting pearls in Bare Escentuals Mineral Veil give complexions an ethereal quality that lasts all day — and the mineral formula is so light, you'll love wearing it. Bonus: It comes in several shades/finishes, if a little sparkle isn't for you. All from Zóe, Memphis' own beauty and skincare super-store (despite its small footprint), 4564 Poplar, in Laurelwood. 821-9900. BRIGHT FUTURE: A little vintage-inspired sparkle is the perfect way to look current this season, according to Joy Moore, owner of Bead Couture. The store mainly caters to people who make jewelry. But when it comes to shopping locally, you can't get much better. Bead Couture also sells jewelry from local artists. Vintage necklace with Austrian crystals, $275. Bead Couture, 2847 Poplar at Humes. 323-9213. Shop This is compiled by Shopgirl. E-mail shopgirl@memphisflyer.com with tips and suggestions for items to be promoted. Please send a daytime phone number and print-quality digital images for consideration. Johnny taylor paints ... and shops too.